Learn about the main factors to consider when designing complex parts and the benefits of working with manufacturers in order to ensure design optimization for cost effectiveness. Many steps go into manufacturing a complex part, which is why it is crucial to maintain a cooperative effort across all departments in order to achieve the best quality and price. We explore how to achieve this goal in our comprehensive new eBook, Cost Effective Design Tips for Machining Complex Parts. 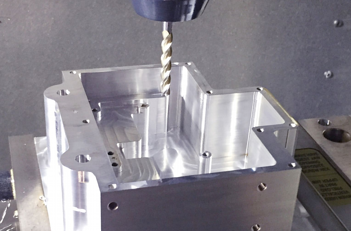 When machining complex parts, there are many key factors to take into account in order to reach ultimate cost efficiency. The first step is material selection, and there are three specific factors to keep in mind: price, delivery and quality. Designs that allow flexibility without compromising quality are obviously ideal, which is why discussing different material options with manufacturers ahead of time is essential in choosing the best option. Next, in the drawing and print phase, it's important to remember that a robust blueprint will be effective for the manufacturer. Specifying details and surface finishes, as well as providing a completed print to the best of your ability, will allow manufacturers to create an accurate part based on your desired specifications. In the machining phase, it's important to account for endmill (EM) radii by avoiding sharp, square, inside corners in a design. It's also extremely imperative to limit machining risk factors by designing assemblies with smaller, simpler parts. The last vital factor to keep in mind is the proper use of Geometric Dimension and Tolerancing (GD&T). GD&T is a means of dimensioning and tolerancing a drawing with respect to the actual function or relationship of part features. The proper use of GD&T can make your parts more manufacturable, thus boosting overall cost efficiency. Here at Ardel, we work with customers to find cost-effective solutions on each and every project. Our project gallery offers a look at some of the projects we've completed in the past for various industries. As an ISO certified company, Ardel is a qualified manufacturer of machined components, parts and contract assemblies for a wide range of industries. Feel free to contact us to discuss your project with our team. For all you need to know about how to achieve cost effectiveness for your next project, be sure to download a copy of our exclusive eBook, Cost Effective Design Tips for Machining Complex Parts.